Roethlisberger passed for 10,829 yards and 80 touchdowns in three collegiate seasons and Miami reached the Mid-American Conference Championship in his junior year. 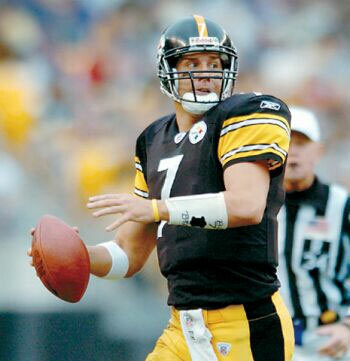 He entered the NFL draft and was chosen by the Steelers in the first round (11th overall, and the third quarterback) and, when QB Tommy Maddox went down with an injury in the second game, “Big Ben” moved into the lineup. Steelers went 15-1 to place first in the AFC North with the conference’s best record while leading the AFC in rushing yards (2464). Won AFC Divisional playoff over New York Jets (20-17). Lost AFC Championship to New England Patriots (41-27). Roethlisberger missed time with a knee injury in 2005 but led the league in yards per attempt (8.9), yards per completion (14.2), and TD percentage (6.3 on his 17 TD passes), and the Steelers won the Super Bowl. In so doing, he became the youngest Super Bowl-winning quarterback. Big and mobile with a strong arm, Roethlisberger also benefited from having a solid running attack and defense as he developed his considerable skills. It was tougher going in 2006 as he was injured in an offseason motorcycle accident and also suffered from appendicitis. The result was 3513 passing yards and 18 TDs, but also a league-leading 23 interceptions and the Steelers dropped to 8-8. He bounced back with a Pro Bowl year in ’07 in which he threw for 32 touchdowns and a 104.1 rating, and showed great toughness as he also took many hits – often due to his penchant for holding the ball until the last possible moment. Roethlisberger led the Steelers to another NFL Championship in 2008 as he showed outstanding late-game clutch ability and achieved career highs (thus far) with 4328 passing yards and a 66.6 completion percentage in ’09, although off-field issues caused him to be suspended for the first four games of the 2010 season. He played well upon his return, giving up just five interceptions while once again leading the NFL in yards per completion (13.3) and the Steelers won the AFC title. Roethlisberger was chosen to the Pro Bowl for a second time in 2011 after passing for 4077 yards but a high ankle sprain limited his mobility in a losing postseason game and a shoulder injury hindered his play in 2012 as he was also asked to refine his style of play with a rebuilding team. He stayed healthy for the full year in ’13 and passed for 4261 yards and 28 TDs. Overall, through the 2013 season Roethlisberger has thrown for 34,105 yards and 219 touchdowns with a 92.6 rating. The Steelers have been 98-50 during his regular season starts and 10-4 in the playoffs, with two NFL titles.